Know Your Property Rights BEFORE Marriage. Ladies, did you know that even if you own a property and it is registered in YOUR NAME ONLY, your divorcing spouse may still have interest in the property via the Notice of Home Rights with the Land Registry? You may own the home but if you marry, move your spouse into your home and divorce in a property you owned prior to marriage, your estranged spouse could possibly block or impede the sale of your property or maintain a vested interest in the home. The great state of Texas is a community property state. Now, while not divorce or asset allocation outcome is the same, it is presumed that ALL property allocation begins with a 50/50 split and evolves from there. Marriage is a wonderful institution, but is not a fairy tale, Like any other contract, you should investigate your rights prior to entering the agreement. However, if you find yourself at a crossroads in need of option to best protect yourself against the financial ramifications of divorce in real estate, you should contact us immediately. If you are divorcing, separated, in a common law or domestic partnership, and want to protect your rights and profits in the purchase or sale of your property, YOU NEED TO have a team working for you and your interests. Be A Mogul. Be the best! How would you like to partner with one of Houston’s leading business owners and emerging real estate leader? In essence, my team members and corporate partners are like my family members. Without them, I wouldn’t be where I am. So what’s the purpose of this invitation? I am looking for more team members—family members—ones that I can work with for life. You are a natural hustler. Willing to get your real estate license and pass the exam. English must be your native language or you have native fluency. You have a constant and reliable computer and Internet access. You are intelligent, self-motivated, and hardworking. You are looking for a long-term partnership because once I find someone I enjoy working with; I want to work with them for life (seriously). You have to be willing to work 40 hours a week. You need to have good time-management skills (you can work remotely). If you have these qualities and skills, you may be a good fit for ONE of the openings below. There are multiple job openings/partnership opportunities, apply to each of the ones that you feel you are a good fit for. We are positioning the MoguLife® Company and brand to be a premier, flagship real estate leader in the Houston, metro, and surrounding areas. We are actively pursuing leaders with professional, diligent business acumen, possessing a desire to be a part of a family, not just a team. We place a premium on relationships and partnership. It is our culture to encourage our agents’ entrepreneurial spirit and at the same time foster the expectation that “we help our own.” Secondly, we value education and training because of our founder’s higher education and corporate development experiences and careers. Education and training have always been a cornerstone of how we do business. We want to equip you for success and create an environment that is so innovative in support and profound in relationship, you will want to be a “Mogul” for years to come. If you are interested in joining our team of agents, fondly called “Moguls”, please send an email to Chairidee Smith for an interview with the position you are interested in. Please send your request to MsMogul@chairidee.com and cc. kmf_businessandrealty@live.com. A “bird dog” is a real estate investing term that refers to someone who spends their time trying to locate properties with substantial investment potential. Usually, the intent is to find properties that are distressed and selling at a discount that can be repaired or remodeled and sold for a sizable profit. Sometimes, however, the term is also used to refer to people who find underpriced properties that would make good income (rental) properties. The term itself is a reference to hunting dogs that would point to the location of birds and then retrieve them once the hunter had shot them. If you are interested in joining the as a bird dog, jumpstarting your investor career, please send an email to Chairidee Smith for an interview with the position you are interested in. Please send your request to MsMogul@chairidee.com and cc. kmf_businessandrealty@live.com. Over the years, many of you have told me that I should write a book about business leadership and how to stay the course until your vision is realized. Well, now... I am. It’s been in the works for more than six months, and it will come out next year. I’ll be announcing more details of the book in January. Digital Marketer/Growth Hacker – you will be responsible for top-of-the-funnel marketing. You should have experience with SEO, social media marketing, conversion optimization, and anything else that could be used to drive sales. 2. Content Marketer – you will be responsible for the editorial content and calendar, supporting this project, and will help identify and target sites with large audiences receptive to our messages as well as craft and create blog posts for A-list blogs and media outlets. You will also help schedule podcasts and AMAs. Being detail- and deadline-oriented is a must, and we’ll need our person to be extremely well-organized and have a passion for putting together insanely great content with a deep knowledge of outlets. Oh, and design skills are a plus. Research Assistant - you will work with us to track down great stories and data. You love getting to the heart of the matter, and you know how to find gems in unexpected places. You’re fearless and committed to new and big ideas while able to gather materials quickly. You will be an integral part of the content team, helping us dig up inspirational and exciting content for the project. For the book project, you’ll be going through three rounds of interviewing before we choose the three lucky individuals. The tasks above will get you through round 1, after which we will give you the next set of tasks you will need to complete. The deadline to apply for the openings for the book project is October 6th by 5 p.m. Central Standard Time. We Had A "Darling" of a Time With Darling Homes. On April 27th, MoguLife Real Estate & Lifestyle hosted "Be A Mogul with Darling Homes." The purpose of this meeting was to convene fellow Realtors and real estate professionals to discuss new trends in luxury building featuring Darling Homes as well as provide Title 101 training for our Realtors, in addition to a sales training intensive. 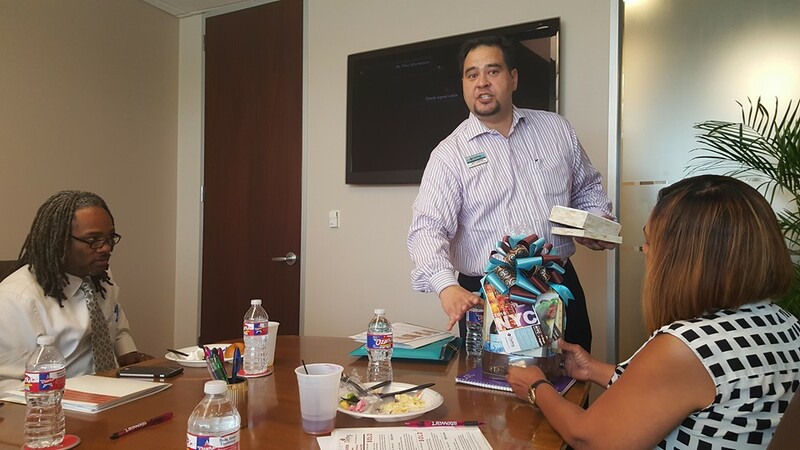 We convened in The Woodlands, TX one of MoguLife's target markets with one of our preferred title companies, Stewart Title. The space as well as the surrounding Woodlands backdrop were inviting and delightful. During the session attendees were given the opportunity to really "dive in" to some of the features and benefits of selling luxury homes, particularly with a builder like Darling Homes. We were also fortunate enough to hear what's on the cusp of future building plans, expansions, and luxury features with this builder all while enjoying a full course meal with desserts. Special thanks to the MoguLife Team, Alanna Williamson of Stewart Title, and Jeff Lester, Community Manager for Darling Homes. If you'd like to attend our training sessions and hear more about becoming a MoguL with MoguLife, please call our office at 832.910.7093. Ladies, Use Rental Income to Fund Your Retirement! #GET IN THE GAME! No rights claimed or implied with us of photo. All rights secured with Columbia Pictures. Real estate has long been one of the more promising ways to hold and build wealth. Retirement is no different. Purchasing a well-located, well-maintained piece of property is a wonderful way to collect income while the tenant pays off the mortgage. If you're willing to #GETINTHEGAME, rental properties offer a rare opportunity to generate extra cash in post-work life. Units in the Houston market can produce an extra $200 to $1,000 per month after expenses. Did I mention that #Millennials are one of the largest population of renters in market? Why not rent to a young, up and coming professional with long-term earnings potential, and collect rent for your mortgage and retirement! That’s #MoguL! Real estate can be a wonderful tool and “partner” in your retirement planning. Many of us will not have the benefit of healthy company-funded pensions, and we’re not really clear about the state of Social Security. You can take your future into your own hands and with a few well-planned, well-informed decisions, you can be more empowered and secure facing your future! Here’s what we know - rents are always going to go up; the value of your property is almost always going to go up and most of your costs are going to stay the same not with-standing medical costs perhaps, but particularly if you assume a fixed mortgage rate. Eventually, even if you're only making a little in the beginning, you will watch your income climb over the years. Another big plus of income-producing properties is that the Internal Revenue Service lets you depreciate the building portion of your property (minus the land) over 27.5 years, which means much of your cash flow will be tax-deferred! Now, you'll have to recapture that depreciation when you sell, but if you never sell it and you own the property when you die, all that depreciation goes away and your heirs don't have to pay it! Chairidee Smith, Ms. Mogul™ is the Founder and CEO of MoguLife Real Estate & Lifestyle, LLC in Houston, TX. To retain Ms. Smith as a consultant or schedule her for speaking, training, or media opportunities, please call the MoguLife Office at 832.910.7093 or email her at kmf_businessandrealty@live.com. Every Woman Can Be A Mogul. The times are changing, both because men have grown more accepting of women, and because women have grown more knowledgeable about the field. The CCIM designation in particular demonstrates that women can, in fact, use a calculator. We can analyze properties as well as show properties with bathrooms and kitchens. We are capable of extraordinary successes if we pursue them! As men's attitudes and women's aptitudes have changed, the industry itself has undergone a transformation. Though our numbers are still relatively small, women are making their presence felt. Even with excellent skills and credentials, women can face hurdles but we are breaking glass ceilings. Women may find themselves passed over for management positions, but real estate is one of those industries where the grounds are leveled quickly if you are prepared for the opportunity. Even in today’s world, gender roles come into play. However, we strongly believe that any woman armed with knowledge, ambition, and opportunity can make some really extraordinary things happen. Every woman can be a mogul. Contact our office today for career and investment opportunities. Go to www.chairidee.com or call the office at 832.910.7093 today.